In Russia, this trend is gaining popularity among tourists. This contributes to good environmental conditions, the presence of the sea, an acceptable cost of leisure and, of course, is its proximity to Russia. People investing in property abroad, you know what to buy now a house in Bulgaria, cheaper than can be even in any place of Russia. To visit Bulgaria and not to do what you love? There are always anglers can find great fishing! But this can cause some difficulty if not to take into account the individual nuances related to fishing in Bulgaria. The fact that absolutely free, in Bulgaria can be considered only fish in the sea. For fishing in freshwater (rivers, lakes, ponds), you must first purchase a fishing ticket, what you need to not only know, but also take care in advance. Fishing ticket can be purchased in any city of Bulgaria in specially created Agency for fisheries and aquaculture (IARA). Annually in Bulgaria, operates a fishing ban during the spawning fish. Timing it usually occurs from mid-April and ends by the end of may. This forty-day ban applies to the waters of the Black Sea, Danube river and all inland waters of the country. For citizens of Bulgaria, and the persons having residence permit, a fishing ticket will cost from 4 to 25 leva depending on the period during which it will operate (maximum sentence of up to one year). For tourists, usually do not have permission for long stay, fishing ticket will cost 35 Lev, which gives the right to fish anywhere (except reserved areas), within a month. Unknowingly, some of the tourists fall for the “illegal” fishing in inland waters, and shall be fined from 20 to 100 leva. However, please note that for fishing in private ponds, fishing ticket purchase is not required. They can fish without it, paying for the cost of fishing only the owner of the pond. Usually, in addition to fees for fishing in this reservoir, the owner shall bear and pay for the catch (the price of fish below market), if the fish is not released back. 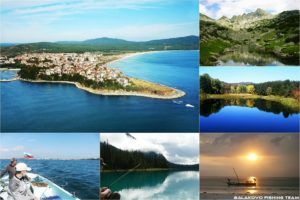 Sea fishing in Bulgaria — absolutely free … unless You decide to rent a boat and guide 🙂 But we’re going there to spend money, isn’t it?